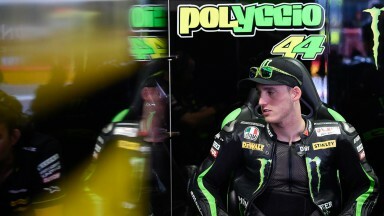 Monster Yamaha Tech3 rider Pol Espargaro produced another strong qualifying lap to ensure he will start the Gran Premio d’Italia TIM from fifth position, despite a late fall in Q2. The Spanish rider was immediately up to pace during FP3 and comfortably set a best time of 1’48.373 which saw him finish eighth, progressing straight through to the second qualifying session for the fifth time in just his sixth MotoGP™ race. His knowledge and confidence around the fast and technical 5245 metre Mugello circuit grew with each lap, which was important due to the loss of time because of the weather conditions in FP2 and he dug deep in Q2, attacking immediately. His first run ensured the Spanish rookie’s best personal time of 1’47.612min was enough to cement a start on the second row with his impressive performance only 0.342 from pole position. Afterwards the reigning Moto2™ World Champion unluckily paid for his inexperience with a fall while going out for his second run, which prevented Espargaro from lowering his lap time anymore. It was the second big crash of the weekend for him, but nevertheless the young Spaniard remains confident to battle for another high scoring points finish during Sunday’s premier class race. Espargaro commented "I am pretty happy with P5 but at the same time I think we were a little lucky that nobody beat my lap time after I fell off. With regards to fall it was a rookie crash as I was too keen to get going and ride fast a bit too fast on the new tyres which were cold. I pushed a little to warm them up but then fell at the fast corner." 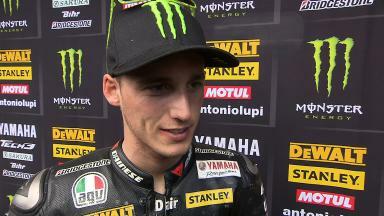 "Still, I feel comfortable with the bike and together with the team we are building my own Yamaha. Also, I am still recovering in confidence since the injury at Qatar but overall am feeling quite happy. It will be a difficult race for sure especially at the start but I feel good with the bike so I look forward to a positive race." His teammate Bradley Smith produced a resolute display to score seventh place on the grid for Sunday’s 23-lap sprint. He said, "I am pleased with my qualifying performances today and especially this morning’s FP3 session where I had a great feeling on the bike and some positive work was undertaken. We need to make a good setting for sector three but on the whole I am happy to be competitive and back riding a bike I enjoy and understand, so I am excited for the race tomorrow."